OUTSPOKEN traditional chief Vezi Maduna Mafu has sought protection from Amnesty International's South African office while claiming President Emmerson Mnangagwa has assigned state agents to trail him and ensure he did not leave his area. 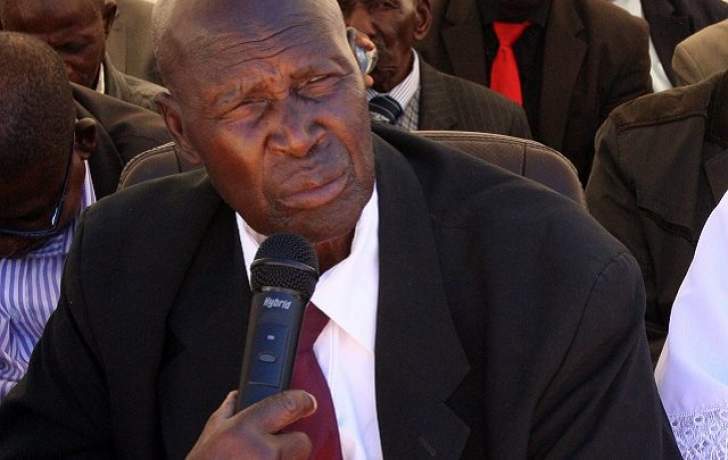 Chief Maduna of Avoca, Filabusi claims he was a likely target of state intimidation following his bold decision to petition Mnangagwa recently demanding a lasting solution to the 1980s Gukurahundi massacres on a majority Ndebeles by the military. The petition, which also demanded the emancipation of the Ndebele, leaked and trended on social media last month. "I, Chief Vezi Maduna Mafu as an elderly Chief of Avoca, Filabusi Communal Lands in Zimbabwe recently torched the hornet's nest when I petitioned the President of the Republic of Zimbabwe over the Ndebele people genocide that was perpetrated by the government under the operation Gukurahundi between 1981 and 1987 using a special North Korean trained notorious military crack force called the Fifth Brigade. "The petition which went viral on social media has raised the ire of the current President who has responded by assigning a District Central Intelligence Officer from the president's office, Mr. Mlotshwa to place me under house arrest and ordered that I report to him all my movements outside Filabusi and give him my itinerary thereof," reads Chief Vezi Maduna's letter to Amnesty International. He fingered the CIO in abductions, murders and disappearances in his carefully worded letter. "Taking into account how Zimbabwe recently voted at the United Nations alongside Burundi over human rights, a quicker action needs to be taken before we experience the tactics used by Saudi Arabia against its journalist critic who was murdered inside the consular," he said. "Also putting into account Itai Dzamara disappearance, the same may happen considering that during 1981 to 1987 Ndebele Genocide, people were abducted from churches. That shows even churches are not places for sanctity of life to the perpetrators of Ndebele Genocide." Another copy of the letter which was received by Amnesty's Harare office on 30 November was sent to the Zimbabwe Lawyers for Human Rights (ZLHR). The Zanu PF government has been accused of using members of its secret service to enforce disappearances, torture and abductions of government critics since the Robert Mugabe era. Mnangagwa was minister of state security and played a pivotal role in the Gukurahundi atrocities that claimed 20 000 civilians, according to independent estimates of the Matebeleland and Midlands killings. As President, Mnangagwa has the power to release the Chihambakwe Commission report on the genocide. Chief Maduna once petitioned Mnangagwa to have then Home Affairs Minister Obert Mpofu appear before his traditional court in May this year. He accused Mpofu of meddling in the Ntabazinduna Khayisa Ndiweni chieftainship. In his earlier letter, Chief Maduna questioned why Mnangagwa had decided to parcel out Matabeleland resources to "foreigners", leaving the local Ndebele speaking people in a state of poverty. "All these points, if taken into account, make it very difficult to directly engage in dialogue over the 1981 to 1987 Ndebeles' massacre/Gukurahundi as these points clearly indicate a sign of no sincerity over the past unhealed wounds. These points in this petition show a continuation of Ndebeles genocide this time as economic genocide. "I am aware that you may not believe the contents of this letter as my words because of my age, I am convinced after reading the contents of this letter your thinking is I have been manipulated or being used by individuals," read the letter. The militant Chief Maduna's bold attitude represents a departure from the often docile attitude of most traditional leaders who for decades have been accused of favouring the ruling Zanu PF government even in matters detrimental to the development of their areas. Maduna's bold challenge on Mnangagwa is a huge test to the new leader's sincerity in observing citizen rights. The Zimbabwean leader's attempts to portray a reformed character on the international stage could have hit another snag after the chief sent similar letters to Amnesty International's London headquarters and the president of the International Criminal Court of Justice.